In today’s increasingly competitive business environment, successful businesses are those that have brand loyalty schemes integrated into the organisation’s core marketing strategy. By focusing on retaining customers, you avoid the high costs of new customer acquisition and losing out market share to competitors. Brand loyalty strategies address the entire customer experience process, from acquisition to return, and the resulting loyal customers tend to be evangelists through word of mouth for your products or services. These ten tips will help you boost customer awareness of your brand and build a positive emotional connection with your brand. Brand loyalty campaigns are ultimately futile if you don’t deliver value in some way through your products and services and focus on the customer’s needs, which usually means solving a specific problem or enhancing their life in some way. Start building brand loyalty by constantly refining your product and services. Know your unique selling proposition and use it as the basis on which your brand loyalty campaigns are designed and delivered. Loyalty is closely tied with customer satisfaction. Research has shown that as many as three in five customers would try a new brand for a better service experience, whilst 70% of the buying experience is based on how the customer feels they’re being treated. Whether or not you’re predominately ecommerce, phone, or web based or have brick-and-mortar stores, design a customer service channel that builds loyalty. This will probably involve everything from culture, systems, technology, data streams, and loyalty programs. Build the public face of your brand by appointing brand ambassadors chosen from your team. Find the experts among your current staff members. These people are likely to make great sources of authority for customers looking to engage with you online via social media channels and through public conversations about issues relevant to your products and services. Research has shown that customers find brand executives to be credible authorities for information and have more confidence in the company when the executive uses the company’s media channels, including social media. In addition, expert content is an opportunity to position your brand as a thought leader in your industry. Marketing channels such as print, online advertising and social media aren’t just for delivering content in one direction; they’re opportunities to engage with customers. Stronger engagement – through content, timely replies and quick and effective resolution of any issues – results in higher customer satisfaction and loyalty. By instilling a customer-engagement culture, your entire organisation works on the basis that they can be ready to engage with, respond to, and work with customers at all times. One effective way to boost brand loyalty is through novel promotional campaigns. These campaigns heighten brand awareness and attract and retain interest through incentives such as discounts, or conditional extras like cashbacks and rewards. These strategies prove to be effective simply because customers love to feel that they’re getting extras or freebies. Best of all, these campaigns do not need to be complicated. You can outsource a part of the process or even the entire campaign to specialist promotions experts who can work seamlessly with your existing marketing functions to increase brand loyalty through long-term promotions and loyalty campaigns. Loyalty doesn’t necessarily have to be a one-size-fits-all process. 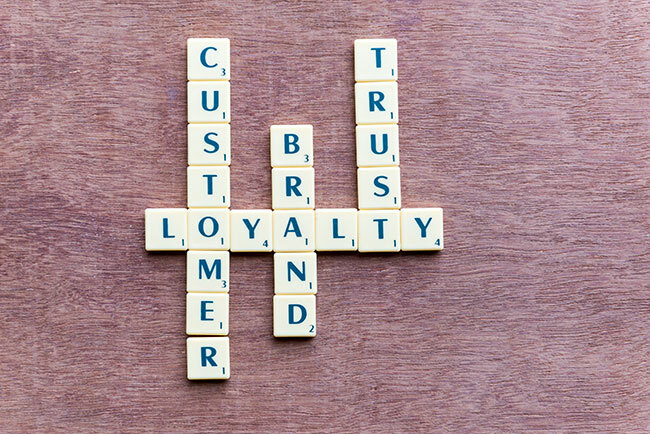 For many brands, the key to sustained loyalty is a stratified loyalty program – which is relatively easy to set up – that delivers customer rewards according to purchase volume or frequently. Rather than rewarding annual customers in the same manner as monthly customers, you reward each customer according to their loyalty level. Most brands understand the importance of mobile engagement, but what are the implications for brand loyalty? Obviously, marketing content channels need to be tailored to be mobile optimised, but mobile also offers other opportunities. These include greater personalisation through location, integration of purchasing, and deeper interactions through social media (which is strongly linked with mobile). Other possibilities include SMS marketing, push notifications through your app and mobile-wallet-based payments. Capturing customer reviews and displaying them on your online channels offers greater transparency and boosts trust and loyalty. If you have negative reviews, you can choose to display them and follow up with a public response to show you have resolved the issue or are working on eliminating the source. At the same time, capture customer success stories and share them online to further humanise your brand. Studies show that customers, particularly millennials, are highly engaged by personalised marketing and experiences, and they will pay more for it. Wherever possible – from marketing strategy to product or service delivery – build loyalty and customer satisfaction by making the customer experience as personalised as you can. No customer base is static, given changing demographics and fluctuating market and industry conditions. By capturing feedback, through timely surveys and follow-up questionnaires, you can find out exactly what your customers are thinking and what you can do to improve. Remember, the ratio of unhappy customers who bother to complain can be as low as 1 to 26, so be proactive about feedback, processing it, and adjusting your operations to address any negative feedback.